An American pickpocket unwittingly becomes the prime suspect in a Paris bombing investigation. Elba's Briar is such a stereotypical action cinema protagonist you can almost see plastic chads hanging from his frame, indicating where he's been broken out of a mould. Once he hooks up with Michael, the movie begins to reference every '80s action movie possible. 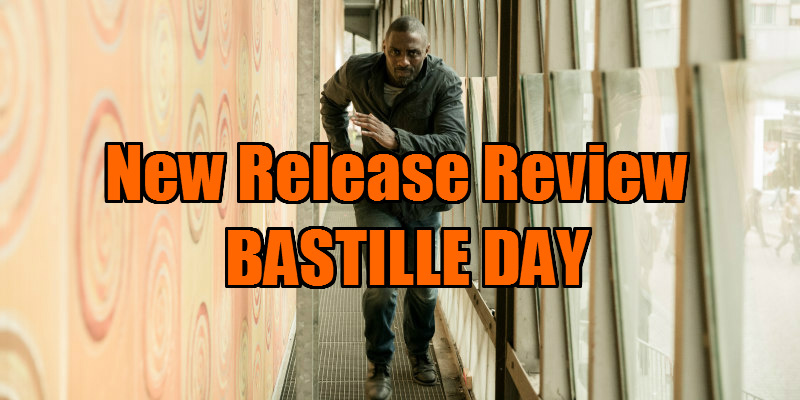 When principal photography wrapped on Bastille Day in Paris in December 2014, nobody involved could have predicted the horrific terrorist atrocities that would devastate the city in the following year. Now released in the untimely aftermath of another mass killing in France's neighbour, Belgium, Bastille Day feels like a relic of a lost, more innocent era. It's a light and breezy buddy action movie, one whose theme song is sung by its star. No movie made from this point on will ever approach the subject of European terrorism in such a superficial fashion. James Watkins' film borrows from a host of sources, beginning with Sam Fuller's Pickup on South Street, as American pickpocket Michael (a wooden Richard Madden) unwittingly finds himself in possession of a bomb after swiping a shopping bag from Zoe (Charlotte Le Bon), an activist in over her head with a gang of shady men seemingly intent on a campaign of terror across Paris. 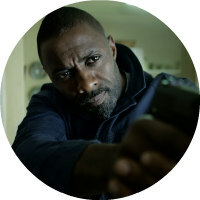 Seconds after throwing the bag in the trash, Michael is thrown in the air by the resulting explosion, and finds himself on the run from both the French authorities and CIA agent Briar (Idris Elba). Elba's Briar is such a stereotypical action cinema protagonist you can almost see plastic chads hanging from his frame, indicating where he's been broken out of a mould. He's an aggressive maverick who doesn't play by the book, much to the chagrin of his superiors, who assign him the job of taking in Michael regardless. When we first meet Briar he's being reminded of how his recklessness led to the death of a young female agent, but this small matter is never brought up again; Briar doesn't do emotional scarring. Once he hooks up with Michael, the movie begins to reference every '80s action movie possible, stealing its main plot point from one of that decade's most celebrated works, and unintentionally insulting the citizens of Paris by doing so. When Elba's imposing agent asks Madden's pickpocket why he initially fled from him, the latter replies, "Have you seen yourself?" 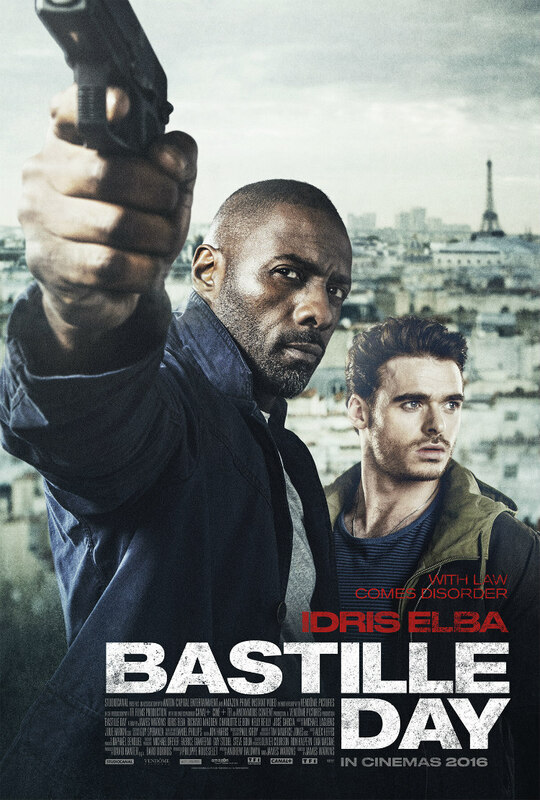 At this point it seems the film might be going somewhere interesting, pairing up a black authority figure with a downtrodden white knee jerk racist, but it's a fleeting moment, with Bastille Day instead playing out like a race reversal spin on 48 Hrs' character dynamic (with a late piece of business blatantly lifted from that movie's 1990 sequel), but one in which race is never again mentioned. The two dart around the French capital collecting action movie tropes like they're taking part in a 'how many clichés can you accumulate?" scavenger hunt. When the obligatory moment arrives for Madden to ask if he can have a gun of his own, Elba frowns, but we're unsure if the reaction is that of the character or the actor.